The 11th century Modhera Sun Temple at Modhera in Gujarat is a temple dedicated to Sun God - Surya and is 35 KMs from Mehsana & 102 KMs from Ahmedabad. 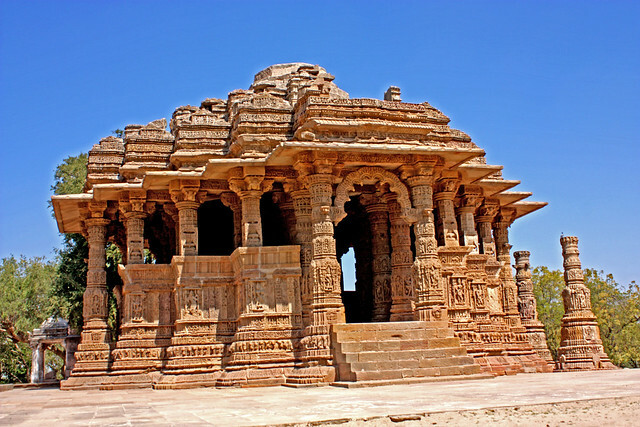 Modhera Sun Temple was built by King Bhimdev I of the Solanki dynasty in 1026 AD. This temple is located on the bank of the river Pushpavati and is an architectural gem. The Modhera sun temple has three main areas, namely Surya Kund, Sabha Mandap and Guda Mandap. Surya kund is a big tank with intricate carvings and miniature shrines adorn the steps of the tank.